AnywhereUSB is a network-attached USB hub. 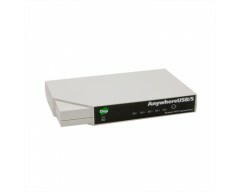 Combining Digi’s patented RealPort® USB and RealPort® COM port redirector technologies, AnywhereUSB connects USB and serial devices anywhere on a wired or wireless LAN, while eliminating the need for locally-attached host PCs. Relocating the host PC to a remote location translates to smaller workstations, enabling deployment without a local PC in kiosks, ATMs, restaurant kitchens, manufacturing lines or any hostile or non-secure area where having a local PC is not practical. The AnywhereUSB/2 provides two USB ports respectively, which deliver the same Plug and Play user experience as onboard USB ports. Software drivers are loaded onto a host PC or server, enabling remote devices to communicate with the host, without changing existing application software. Peripheral devices can be centrally managed and monitored from a remote server or PC via an IP address. AnywhereUSB is compatible with bulk or interrupt type USB devices such as bar-code scanners, printers, fingerprint scanners, mice, pole displays, card readers, flash drives, security keys, and more. It is an excellent solution for networked USB or serial devices in VMware and Microsoft virtualized environments. Watchport/V3 USB camera (click here to see a live video feed), Watchport® sensors and Edgeport® USB-to-serial converters are also fully compatible with AnywhereUSB.